NB: We often review these processes so if you are reading these pages whilst weighing up your options, please be aware that there may have been changes to prices and detail subsequent to publishing. The following information does include quite a lot of technical advice, if you would prefer to talk to somebody please call us on 0121 632 6070 for a friendly informal chat and I can discuss the issues and hopefully give the best advice possible. Mike. Q: My engine definitely has a problem. Can you help? Yes. Firstly, let’s explain: The Smart car has been around for a while now and indeed the earliest cars are now over 16 years old. The Smart car has a small engine and it’s fair to say that these are starting to wear out. However, they are almost always totally rebuild-able. At Smart-TECNIC we have identified problems that can afflict smart cars and engine problems are almost always the following: 1) High oil consumption, which leads to misfires caused either by burnt spark plugs or a burnt exhaust valve. 2) Timing chain issues. 3) Severe smoke from the exhaust pipe. Q: I’ve had to keep topping my engine up with oil and now the engine is running very roughly. What can you do and how much will it cost me? High oil consumption is caused by the failure of an oil control piston ring deep within the engine to function properly. Sadly there is nothing that can be done about this without major engine work and if the car is continued to be driven it will result in more damage to the engine. 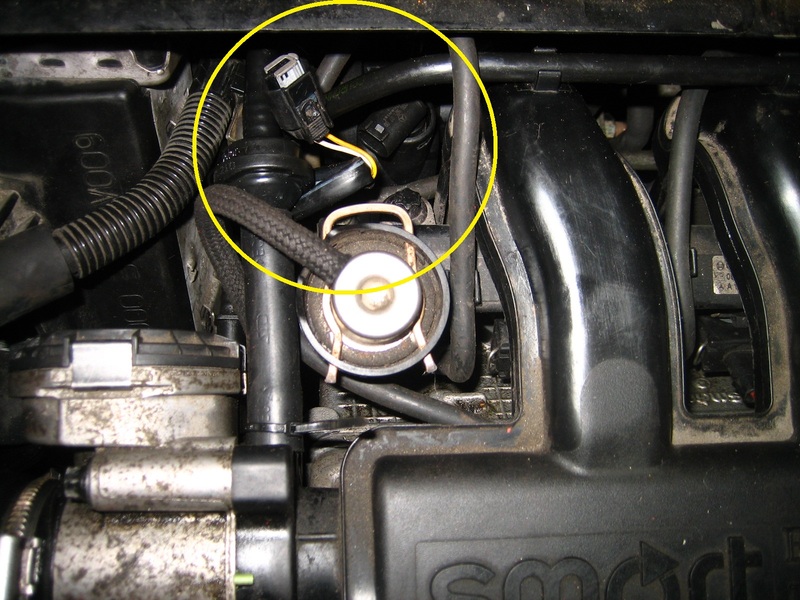 Very often the first components to fail will be a spark plug(s) which will suffer from melted electrodes, and the owner will notice this when the car develops a misfire. The reason you may be having to frequently top your engine oil up is because the engine is burning the oil as part of the combustion process due to the failure of a piston ring as mentioned. This causes higher combustion temperatures that then damages the engine, usually by fouling or melting the spark plug electrodes and/or exhaust valves. The oil consumption rate can be high and yet still the engine does not produce smoke. Smoke from the exhaust pipe is indicative that the engine has other problems. If you have a smart car that has high oil consumption and a misfire then we would urge you to contact a reputable specialist for advice – and naturally we’d prefer you to choose us! We can tell you that the misfire is almost certainly not due to a failed coil pack or plug lead(s), as these components are very robust. If the spark plugs are replaced and the vehicle is continued to be driven then almost certainly an exhaust valve will then burn and partially melt away, causing a misfire which again can only rectified by an engine strip-down. Our least-expensive remedy to this issue is our Level 1 Engine Rebuild, and the price of this (in April 2018) is £995 including vat. Removing the engine from car and stripping down to component parts, cleaning, checking and measuring of components, cylinders honed (this is vital), new piston rings in all cases, new exhaust valves, new big-end shell bearings, new big-end bolts, new headgasket, new headbolts, and all that is required to return your engine to full health. The engine is carefully reassembled using new fasteners, gaskets and seals as required, new oil and oil filter, new air filter, new breather pipe (which has a one-way valve which fails in time) and new spark plugs. 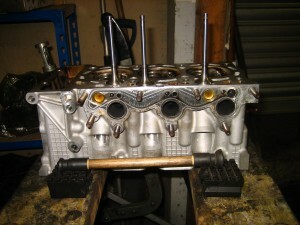 The engine is then refitted into the car and afterwards the car is given a road test and then thoroughly checked before . This is not a full engine rebuild but it will rectify the problems that we have described, and as long as servicing schedules are adhered to the engine will last a good number of years, it is our intention that the engine will last for the remaining life of the vehicle, even if that may be for many years. The ‘bottom end’ of Smart engines are known to be strong and normally no work is required on the crankshaft or main bearings and so these are not dealt with in the Level 1 build. 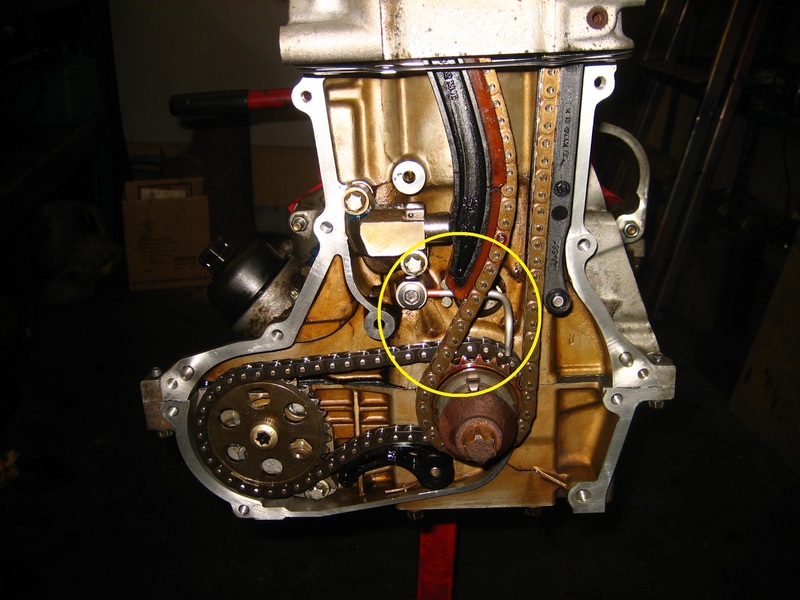 Any work that is needed on the bottom end of the engine is almost always caused by timing chain issues, so please refer to this section below. Level 2 Rebuild – £1,255 inc vat (For 450 models without AC – Please call us to check prices for your model of Smart car). Thermostat: A component that is tricky and time consuming to change when the engine is in situ, but is a component which is removed and replaced during a rebuild; We have found that all thermostats fail in time, but the decrease in efficiency is so slow that owners invariably are unaware of it. When we fit a new thermostat owners have found that the output of hot air from the car’s heater is transformed – you will definitely notice the benefit come winter time. Also on the coolant side – The turbos on these engines are liquid cooled, and have two thin steel coolant pipes that feed engine coolant into and out of the turbo. One steel pipe is a lengthy one which runs around the cylinder head, buried under a mass of engine loom, leads, cables and so on, and is a really fiddly and lengthy task on it’s own. As with the other parts, we have these parts in our hands and it is just simplicity itself to fit new ones in place of the old. Oil Nozzle: A small oil sprayer pipe which lubricates the lower camshaft and oil pump sprockets fitted on the nose of the crankshaft. It has been known for these to fail, especially when struck by the timing chain. It is a small component that is easily changed when the engine is apart. Oil Sump Pan: The sump pan is prone to corrosion on older cars, and is also difficult to remove from the engine due to the high quality sealant used. 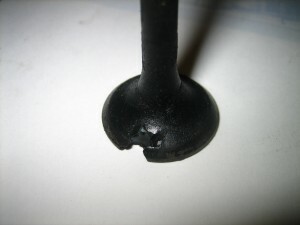 During removal the strain placed on a sump which may already be weakened by corrosion can cause it to leak when refitted. The sumps are not very expensive to replace so we fit a new one along with new fasteners. Forward Engine Mount: Nearly every engine we work on needs this component replacing. It is one of three engine mounts but the forward mount is the one that controls the engine ‘rock’. If you have ever noticed any jerkiness in your car when moving slowly in stop-start traffic, then a failed forward engine mount will almost always be contributing to this problem. Fuel Filter and Drivebelts: The Level One build will include service items such as new oil and air filter and spark plugs; our Level Two build also includes new fuel filter and new drive belts to alternator and air conditioning (where fitted). Engine Earth Cable. The original earth cables were a copper braided type and they corrode in time. We replace these with the updated Mercedes supplied insulated items. The cost of repairing any other damage found within the engine is not covered in the costs of these two levels of build. The chances of any further damage being caused is greatly reduced by acting sooner rather than later. In almost all cases we have experienced, the longer the car has been driven with high oil consumption, misfires or very rattly timing chains, the greater the risk of further expense. Please feel free to call us for advice, we are open, friendly and honest and are always happy to talk to customers. Please note that the main crankshaft bearings are not replaced as part of either level of rebuild. This is because these bearings suffer almost no degree of wear, and are a perfect match to the crankshaft. The only time the main bearings suffer wear is due to issues connected with a worn timing chain, whereby particles of metal have been released into the engine oil and this has damaged the bearing surfaces. Normally if the main bearings need replacing then the crankshaft would need re-grinding as well. 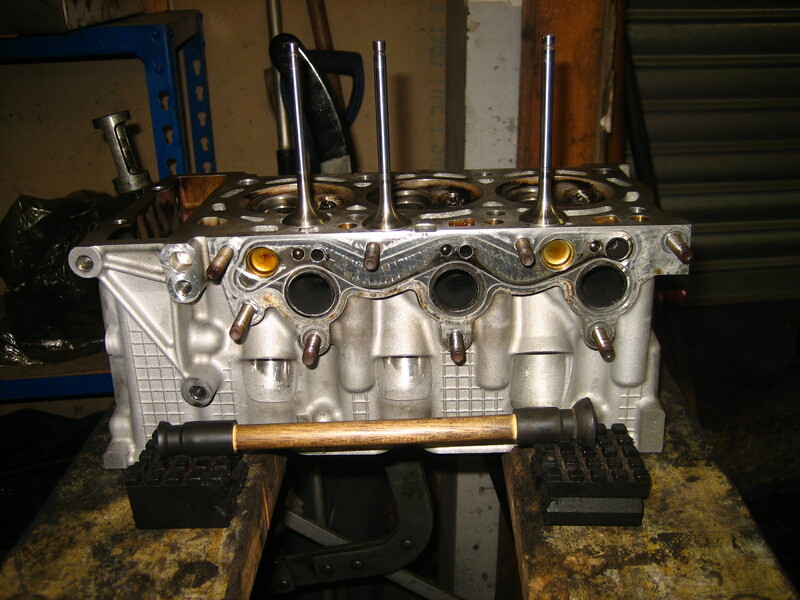 Unfortunately some engines we have worked on have been found to have suffered problems with camshafts, timing chains and valve-gear, almost always caused by wear or failure of the timing chain. It is for this reason that we highly recommend having a new timing chain kit fitted at approximately 75,000 miles, and this is particularly important on the 700cc models. The chains themselves very rarely break, but they do suffer wear. As the chain sprockets wear the chain tensioner becomes less effective and the rate of wear accelerates. As the components wear fine particles of metal are released into the oil. The oil filter fails to extract all of these particles out of the oil and thus the particles are carried through all the bearing surfaces and damage is caused. Sometimes the chain is able to machine itself through the timing case and a heavy oil leak occurs, or the metal particles jams up the hydraulic valve lifters causing a failure and breakages of cam followers etc. We normally charge £465.00 to change the timing chain kit in situ on a city-coupe or fortwo, but when the engine is apart the cost is for parts only at £130, and thus a saving can be made. The turbocharger unit, which includes the exhaust manifold and waste-gate actuator, is an ancillary part of the engine and is not covered by any engine work. If you’d like us to check your turbo unit out please let us know. The Turbocharger and exhaust manifold unit can be a problem on Smart cars, because neither the turbo or exhaust manifold is available separately; both must be bought together as a unit, which comes with a new wastegate actuator also. All our rebuilds include a diagnostic scan of the vehicle and fault code clearance plus a free adjustment of clutch bite point. For a further £50 (on all models) we can carry out a service inspection of the car using our multi-point check list which is tailor-made for smart cars. If this were to be carried out on the level 2 build there would be no need for a further main C Service until four years after, which represents a considerable saving. Q: Is there a danger of me spending more than the car is worth? The smart car is well made and is a particularly sturdy little machine. In our opinion both the bodywork and the interiors of these cars stand up to the test of time better than many other cars on the market, and in all other aspects smart cars are very reliable. You may decide that the cost of having your engine rebuilt is not worth it and you may decide to replace your car. However this will then mean that you will have to sell your car at a much-reduced value, and then you may be venturing into the unknown with a replacement used car. We say that if you like (or indeed love, as many owners do) your smart car, and you have been very happy with it then we think ‘stick with the devil you know’ and by having your engine rebuilt your car will have years of life ahead of it. The value of your car will be enhanced and it will return to giving the economical motoring that smart car owners enjoy. We guarantee the work that we do for 12,000 miles or 12 months, whichever is sooner. At Smart-TECNIC we prefer to be open about the costs that the owner might face and help the owner to make the right decision. If you have any further enquiries please don’t hesitate to contact us via the information shown at the top of the page. We can collect and deliver your car back to you, nationwide. The charge is normally approximately £1.10 per mile but we can be flexible about these costs, particularly if we are out and about or transporting a car to your part of the country. If you’re local to us we may be able to collect and deliver free of charge. Our location is now just off Birmingham city centre. We are easy to get to and have all travel links situated nearby. We endeavor to keep our customers updated with the latest information we have about their cars and how we are progressing with the work on their engine. To this end we need a contact number on which we can reach the customer, and if possible, we like to take two numbers because we do sometimes find we can not get through on the number given. Obviously in today’s world there are many times (when at work for instance) that a customer cannot take a call, but equally we also need to ask the customer to understand that we may need to stop work until we have spoken to the customer, and that this can sometimes lead to delays in the completion of the job. Looking at eBay, there are much cheaper engine rebuilds being advertised. There are definitely cheaper rebuilds than ours out there, and naturally we would advise caution. It can indeed become depressing to see how many fly-by-nights come and go on a regular basis, particularly on e-Bay, offering to carry out work at a price that greatly undercuts established businesses. We do it properly. We make every effort to maintain factory-standard build quality, we make considerable effort (and not a little expense) to ensure the correct fasteners are used, which we’ll purchase from Mercedes-Benz where alternatives can not be found. We know what it costs to do the work we do, and we are a law-abiding, tax-paying business which strives to do things correctly, as customers would want. We know what the parts cost, we know what the overheads are, we know how long it takes, we know what is needed to earn a living and we know that there is one very easy way to undercut proper businesses like ourselves – which is to cut corners. At Smart-Tecnic we have no intention of cutting corners and can always keep back the parts we have replaced for your inspection if you wish. We are always available to speak to by phone and customers are welcome to drop by at any time and can see the work in progress. We trade on our name and reputation which are very important to us. We will not be disappearing anytime soon and nor will there be or ever has been any changes to our trading name. Therefore, we are not the cheapest but we are in line with other reputable, independent smart car businesses.